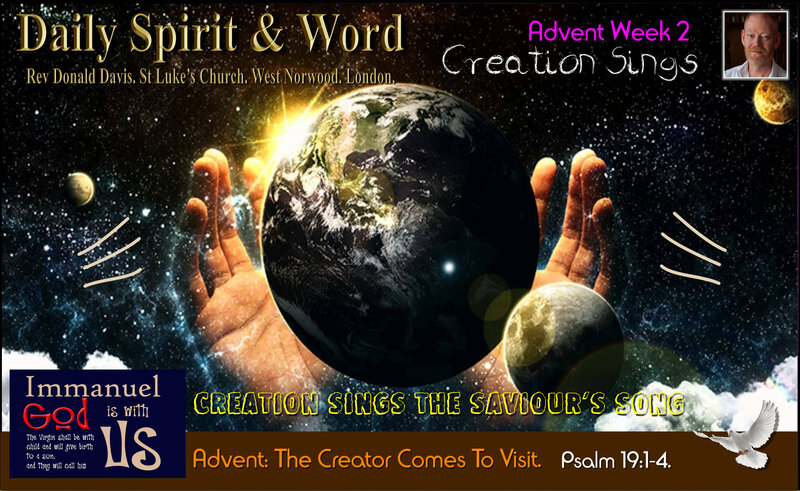 Daily Spirit & Word: 820: Creation Sings The Saviour’s Song. When the Shepherd’s heard the Christmas Angels praising the Lord, they trembled in fear. When we gaze in awe and wonder at Creation, that same sense of wonder can fill our souls too, because the Universe is so vast, endless to us, but not to God. He sees in an instant all of Creation, because the Bible tells us that it is by HIS POWER it’s sustained (kept going). The Heavens Themselves declare the Glory of the LORD. If only we had the eyes to see and ears to hear their song. If you’ve ever doubted that God exists, look skywards into the Heavens at night, there you’ll see a canopy of glory that sings the Saviour’s song. If you can’t hear it, shake your head, spin around three times and fall over… LOL. It’s so obvious that if there is a CREATION there must be a CREATOR. Thankfully there is no “IF”, because we know that the moon and stars are real, men have travelled to the moon and brought back some moon dust, we’ve landed explorers on Mars and measured some of the elements of distant planets… CREATION is not some kind of phantom illusion, it’s real, it exists. It can’t have come into existence of it’s own accord, so reason and logic bring us to the answer: It was MADE by someone, that someone is GOD who’s revealed Himself to His Creation in Jesus Christ. Oh LORD, give us ears to hear Creation’s Song. Have an awesome, awe filled weekend praising the LORD as you join in Creation’s Songs. @ St Luke’s Church in West Norwood, London. Come along and have some fun. 16 For by him all things were created: things in heaven and on earth, visible and invisible, whether thrones or powers or rulers or authorities; all things were created by him and for him.